On a national scale, January 2018 saw the introduction of the UK’s 25-year plan to take charge in our global aim to tackle the current usage of single-use plastics. Likewise, the EU has recently approved a single-use plastics ban, a vision which will become reality by 2021. Our single-use plastic packaging forms a staggering 40% of plastic produced, and this is used just once before it is discarded. The general populace’s shifting attitudes towards this crisis is best, and most interestingly, shown by the fact that the Collins Dictionary has announced “single-use” to be their 2018 Word of the Year. Consequently, these recent years have witnessed the rapid emergence of a new trend. Nationally, and indeed globally, the problem of single-use plastic packaging is being ever-increasingly highlighted in the media. Amidst our new recognition of this consumer mal-practice, the zero-waste food store continues to grow in popularity. Zero-waste food stores enable consumers to undertake their normal food shop in a way that completely eliminates plastic packaging. They utilise ‘weigh your own’ dispensers to provide cereals, grains, oils, flours, dried fruit, herbs and spices, alongside fresh organic fruit and vegetables. By selling these foods in a way that enables the customers to choose exactly how much they want they also cut down on food waste, which can be a real problem for people living on their own. 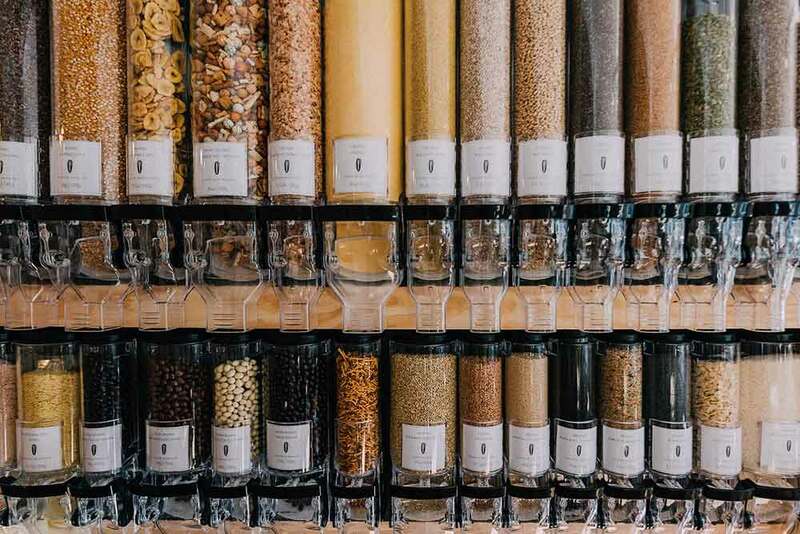 The emergence of zero-waste stores has also come hand-in-hand with the recent growth of a clean-living and organic, natural food trend, making these shops representative of a wave of environmentally-conscious thinking. Likewise, the popularity of these shops has thus paved the way for a whole host of locally-sourced new and innovative products. We’ve come full-circle, having gone back in time to the way we used to buy foods before the introduction of single-use plastic packaging. Since we managed without it before, we can certainly do it again. However, with this re-introduction, there are obvious problems that once more need to be considered. These include factors regarding hygiene, cross-contamination of allergens, and damage to products, which plastic packaging normally prevents. Yet, this concept has been effectively modernised by using sealed dispensers that are designed to rotate stock, which is released using funnels at the bottom. Oils and liquids are also stored in air-tight dispensers, and all products can be purchased using containers brought from home. Additionally, these stores have emerged at a time where the populace is highly receptive to such changes. So these issues, which may have prevented the emergence of such stores before, have now been outweighed by a bigger desire to improve our current practices. Locally, there is an extensive range of zero-waste stores including The Zero Waste Shop in Devon, which was the UK’s first zero waste whole-foods shop in 2017; Save a Packet in Kingsbridge; The Real Food Store in Exeter; Nourish in Topsham; The Refill Store in Truro; the Weigh Inn in Penzance; Earth.Food.Love in Totnes and Lesser Litter in Taunton. These shops are also on the increase throughout Europe, America and Australia. The zero-waste revolution shows the extent to which customers and consumers influence the market place. It has been wonderful to see just how much businesses’ attitudes towards unnecessary plastic packaging have altered in the past few years, and that change has been hugely influenced by customers. These stores provide a new shopping experience; offering both delicious food and an opportunity to choose our own consumer habits in a realistic and affordable way. Our ethical choices have clear benefits and positive repercussions, and it is wonderful to see the initiative, positivity and optimism that these shops encapsulate.